A new piece of street art has been unveiled opposite Etihad Stadium that is in stark contrast to its drab surrounds. 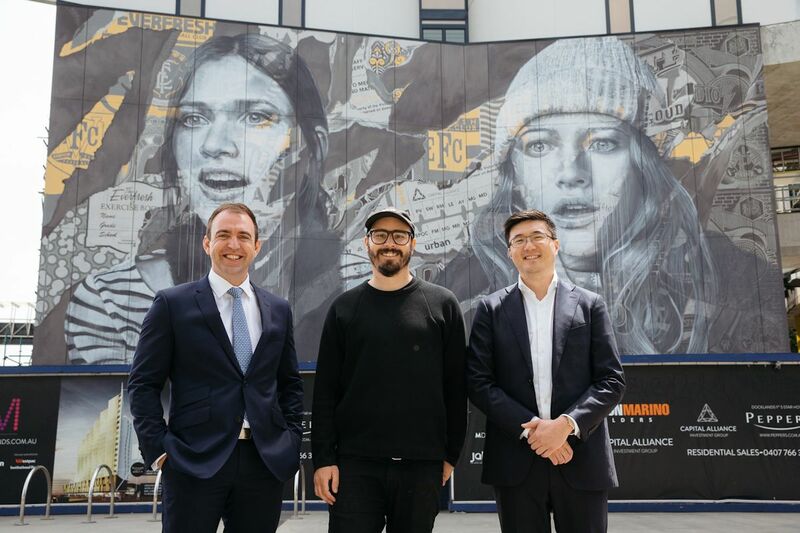 The poorly activated surrounds of Etihad Stadium has been given a boost with Melbourne developer Capital Alliance commissioning internationally recognised street artist Rone to create a mural overlooking the sporting venue. The result is a new 140sqm edifice adoring M Docklands, a new five star hotel and residential complex which will officially open during January 2016. Although Docklands carries varying forms of public art, Rone's Edge of your seat is considered the first ever piece of street art to land in Docklands. With the art medium commonly seen throughout the Hoddle Grid, Docklands' first addition is a welcome boost to the urban realm and the result of 250 hours of labour. Edge of your seat is a continuation of Rone's penchant for paintings of glamorous women, while attempting to create an iconic form of urban art with a strongly emotional bent, according to the artist's website. This piece celebrates the connection to the Melbourne sport scene and captures the transcendence of supporters in moments of high anticipation. The challenge was to capture this emotion and the expressions on the fans’ faces, as they passionately support their team in victory or defeat. We’re thrilled to combine these three pillars of Melbourne’s identity in one piece of art, with one of our city’s finest artists celebrating sport on the side of a new five star hotel. Telstra Dome, Etihad Stadium or whatever guise the venue has taken over its existence must surely be one of Melbourne's most poorly conceived modern additions in terms of both design and influence upon the immediate urban realm; essentially the venue is a non-urban design in a very urban setting. Its shortcomings have been compounded by many of the surrounding buildings which have reciprocated, in effect creating an inactive chasm and a very harsh built form environment for pedestrians/sporting fans who traverse the precinct. Both M Docklands and its sister building Lacrosse in many respects provide an excellent human scale experience relative to other buildings surrounding Etihad Stadium. Engaging podium design, permeability and visual intrigue have thankfully not been lost, with Rone's Edge of your seat adding further diversity where it matters: at ground level. At some point in the future, Etihad Stadium will receive a much needed overhaul, but until that day arrives pending large-scale developments neighbouring the stadium such as AZX Group's 685 La Trobe Street and Salta's 695 La Trobe Street have the opportunity to further the decent public realm outcome achieved by M Docklands, or further slide the precinct into a design 'abyss' for lack of a better term. Check out the timelapse video we did for this amazing project!